A 3D Mexican animation directed by Disney veteran Bruce Morris, The Great Miracle is a tale of religion and redemption, due for release at the end of 2011. But it's the return of composer Mark McKenzie to the spotlight that seems to have grabbed most people's attention. However, it's not just a return; it's a gloriously triumphant one, with McKenzie grabbing possibly the best reviews of his career for the score. And for once the hyperbole is justified. The Great Miracle is a lush, sweeping, spiritual score of the kind that has become all too infrequent of late. McKenzie has shown such potential throughout his career, and his background working as an orchestrator for the likes of Bruce Broughton and Danny Elfman comes into full force here. McKenzie brings both his technical expertise and skill with melody to bear on The Great Miracle, conjuring up a score that is assuredly a masterpiece. From start to finish, McKenzie's score washes over the listener in waves of beauty. The marvellous thing is the score never blends into a homogenous mass; little nuances and variations in its texture keep it dynamic and compelling throughout. It bears close comparison with the soul-inspiring work of Ennio Morricone, especially scores such as The Mission and Padre Pio, truly the highest compliment one can give. Traces of James Horner's more ethereal work also creep in on occasion, and it also calls to mind Thomas Newman's masterpiece Angels in America. 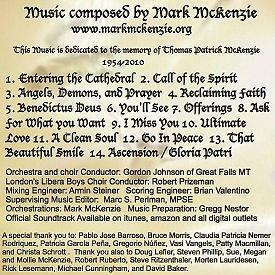 Right from the awe-inspiring beginning, "Entering the Cathedral", it becomes clear McKenzie has poured his heart and soul into this score. The mixture of large choir and orchestra is hauntingly beautiful and impeccably mixed; and the thematic writing is memorable and lovely. Vocals are a mainstay throughout the album, and are subtly manipulated to produce contrasting moods, be it elegiac and hopeful ("Call of the Spirit") or cathartic and uplifting ("Ascension/Gloria Patri"). "Benedictus Deus" even brings in The London Libera Boys Choir, subtly altering the texture of the score. In terms of the orchestra, strings are prominent throughout and McKenzie is sensible enough to vary his palette so darker material can creep in. "Angels, Demons and Prayer" is the most notable example of this, an excellent example of musical storytelling, moving from light to darkness and back again. The surging stringwork and chanting choir in "Offerings" is outstanding; by contrast, the stripped down, almost ghostly intimacy of "Ultimate Love" is heartbreaking. "Go in Peace" brings in piping brass that somehow conveys the sense of a spirit moving on; and penultimate track "That Beautiful Smile" is moving and intimate, placing more emphasis on woodwind prior to the awesome conclusion. That McKenzie is able to invest his score with such nuances and little variations is a testament to his immense skill. It may be hard for him to top The Great Miracle and it will be very difficult for other scores to top it in 2011. It's a firm candidate for score of the year: beautiful, moving and powerful, and proof that it's not only Ennio Morricone who's willing to put faith in soulful, spiritual film music. Fans of film music should not hesitate to snap up Mark McKenzie's tremendous score and thankfully it's available for MP3 download on Amazon at the following links - Amazon.com or Amazon.co.uk. 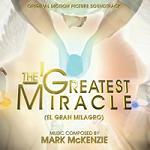 A limited edition CD release is also now available with the title translated as "The Greatest Miracle". The CD contains 2 Bonus tracks "Pictures With Black Bow" and "Bus Accident", and it is available from this link at BuySoundTrax.